This page is no longer in effect. Tom is no longer carving custom work. l How much is a Custom Hand Carved Sign? Your budget for the sign. Approximate size of the sign. 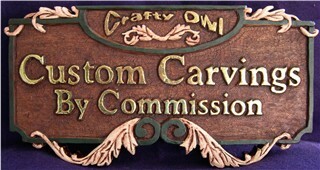 Desired wording for your carved sign. Images desired on your carved sign. Type of wood for your carved sign. Intended use - indoor or outdoor.